Ninety-nine percent of the world, however, uses the term football in reference to our American soccer. This year has brought us a cornucopia of soccer madness, starting with the World Cup in Brazil, and the recent start of the club season for teams all over the world, except for the United States, which is on its own schedule (as not to compete with 900-pound gorilla--the NFL). My favorite league is in England. The English Premier League is the most-watched league in the world. I like the Premier League because it has the largest collection of soccer talent from countries around the world, playing in a single league. On any given week, any English team can defeat a more powerful opponent. It's a potential David vs. Goliath week in and week out. That's exciting! That's what makes the EPL The best. In conjunction with my love for EPL soccer, I play "fantasy soccer." Fantasy soccer is an online competition in which individual players from around the world create a team of EPL players and, based upon their performances in a match, are awarded points. The more points a team of players earn, the more success a team achieves. To be the best at fantasy soccer, a team manager has to pick the right players, with consideration to a "salary cap," which limits a manager's choice of players. Having a salary cap is very similar to how you and I act and think when we are shopping. With a limited amount of money to spend, we have to make choices. For me, there is an amazing feeling when I purchase an item, knowing I bought exactly want I wanted at the lowest possible price. It's called getting yourself a "bargain." This week I achieved an unbelievable accomplishment. 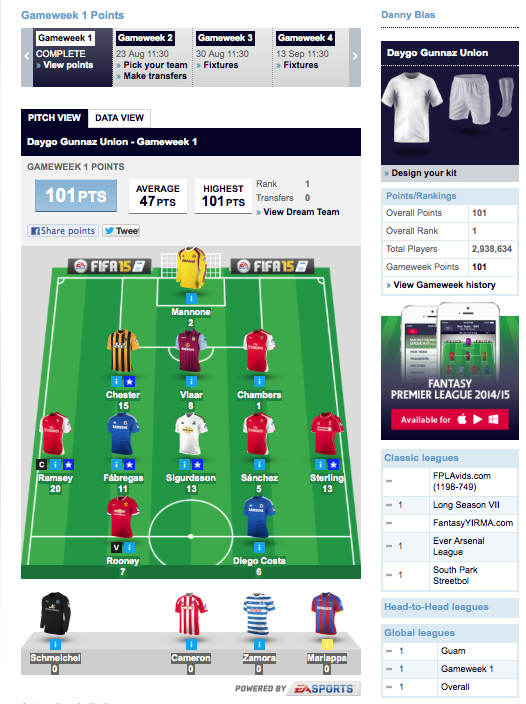 My fantasy soccer team scored more points than ANY team in the entire world! Some 3,000,000 managers play fantasy soccer, and to be one of the managers to score the most points (101 points; average score was 47) is a once-in-a-lifetime achievement. All of my soccer friends are in awe of my accomplishment. Statistically speaking, being number one in the world is a feat reserved for someone else from a faraway country. In my experience of playing fantasy soccer, there has never been a manager who bested the entire world, and to have the top fantasy soccer manager in the world at Kearny High School is just unimaginable to me. A little about my history as a fantasy soccer manager: I have played for six season with relatively little success. During the past six years, I have observed some of the best managers, and how they assembled some of the best squads and I have learned a lot. My relatively poor performances of the past has given me the desire to improve. The need to improve, constantly improve--never being satisfied with what I accomplished today--is the key to being a top performer. Being the best that I can be, with little consideration of what others are doing (or not doing), focusing on my performance, enabled me to be the best I can be. If the best I can be is also the best in the world, then be it. However, being the best in the world is fleeting. Tomorrow there will be a new best in the world. I still must compete with myself to better my past performance. If I can continue to improve, then I will be satisfied, regardless if I'm best in the world or 2,999,999 in the world.